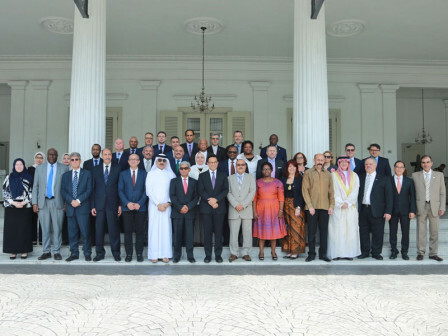 Jakarta Governor Anies Baswedan, welcomed tens of country ambassadors at City Hall as a series of activities for the Diplomatic Corps Gathering 2019.
" We also simultaneously absorb the opinions or judgments of ambassadors regarding Jakarta"
On April 9, 2019, Anies had welcomed a visit of Asia Pacific countries through the gradual meeting, which was expected to have more intense conversation and discussion. In the meeting, he explained the ongoing development programs in Jakarta to the international community. "We also simultaneously absorb the opinions or judgments of ambassadors regarding Jakarta," he expressed, Thursday (4/11). It also became an opportunity to explore cooperation in various fields, which can benefit both parties. "Those can be a source of information, either inside or outside the country to give benefits to Jakarta, especially in the field of trade," he stated. They also conveyed memorable experiences in Jakarta, especially in relation to public facilities and the frequent hobbies. "There is a proposal to add a beachside restaurant in Ancol and some tell us about their hobbies in jogging and I propose them to visit the Ragunan Zoo which has a very wide Green Open Space," he uttered.